Welcome new Ph.D. student, Vickie Frazier! Welcome REU student, Holly Nichols (from GA Tech), and new undergraduate student researcher, Julie Coloumb! Our Lab Manager, Audrey Paterson, received the 2018 Excellence in Laboratory Safety award from the Office ​of Research and Engagement Congrats, Audrey! Thanks for keeping us safe! 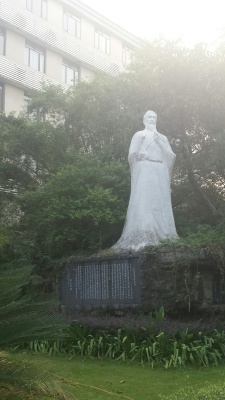 Dorigo et al. (2017) Cave hygropetric beetles and their feeding behavior, a comparative study of Cansiliella servardeii and Hadesia asamo (Coleoptera: Leiodidae, Chelevinae, Leptodirini). Acta Cartsologica 46 (2-3) DOI: http://dx.doi.org/10.3986/ac.v46i2-3.4936. Niemiller et al. (2017) Rediscovery and conservation status of six short-range endemic Pseudanophthalmus cave beetles (Carabidae: Trechini). Insect Conservation and Biodiversity. 10:495-501. doi:10.11/icad.12263. Welcome Abby Harmon, Research Coordinator! Graduate student, Chantelle Fortier, presented her research as a poster at the Geological Society of Aerica meeting in Seattle, WA, October 2017. We are looking for NEW STUDENTS for several projects, one funded in July by the NOAA RESTORE Science Program! Congratulations Dr. Terri Brown and Brandon Bagley for your recent graduations from UT in May. 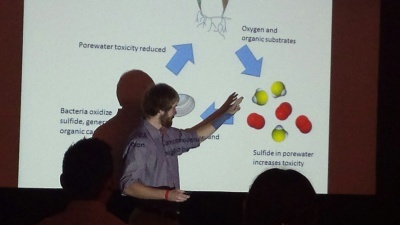 Congratulations, Brandon Bagley, for successfully defending your MS thesis! Welcome Yuan Yun to the lab, joining us for 1 year on an exchange. Keenan and Engel (2017) Early diagenesis and recrystallization of bone. Geochimica et Cosmochimica Acta. 196: 209-223. DOI:10.1016/j.gca.2016.09.033 . Congratulations, Terri Brown, for successfully defending your Ph.D. dissertation! Undergraduate student, Hunter Johnson, presented his independent research as a poster at the Geological Society of America meeting in Denver, Co., September 2016. 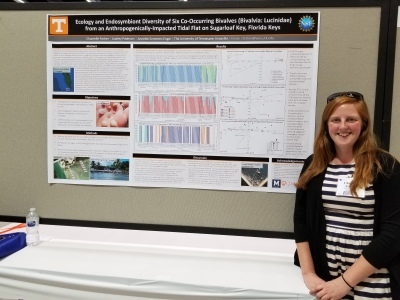 Dr. Engel, Audrey Paterson, and undergraduates taking GEOL 490 (Field Studies in Coastal Biomes) travelled to San Salvador, The Bahamas, this past month to conduct research for the lucinid chemosymbiosis project. They were joined by collaborator Dr. Laurie Anderson and her students from the South Dakota School of Mines and Technology. Welcome Kenneth Boling and Chantellle Fortier to the lab group this summer! Kenneth is starting his PhD and Chantelle is a MS student. Welcome Dr. Xiaoben Jiang, new postdoctoral researcher in the Engel lab! Welcome Dr. Qiufang He, a visiting professor from the School of Geographical Sciences, Southwest University, Chongqing, China! Feb 2016 - Annette, Audrey, and Brandon attended the Gulf of Mexico Oil Spill and Ecosystem Science conference in Tampa, Florida. Also joining them was Dr. Xiaoben Jiang, a new postdoctoral researcher who will join the lab in March. Welcome Sara Santarelli, new MS student in the Engel lab! Kathleen, Walt, and Aaron graduated December 10, 2015. 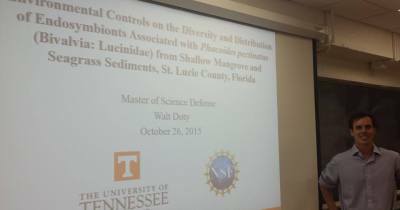 October 30, 2015 - Congratulations, Kathleen, for successfully defending your dissertation, "Microbial diversity and function within an epigenic cave system and implications for other limestone cave systems"
October 26, 2015 - Congratulations, Walt, for successfully defending your thesis, "Environmental Controls on the Diversity and Distribution of Endosymbionts Associated with Phacoides pectinatus (Bivalvia: Lucinidae) from Shallow Mangrove and Seagrass Sediments, St. Lucie County, Florida." 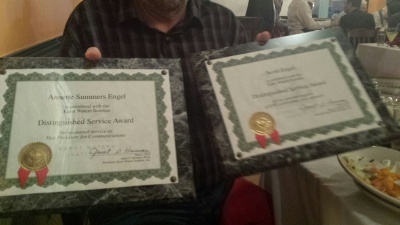 October 2015 - Annette was named Fellow of the Explorers Club. October 2015 - Congratulations Kathleen! 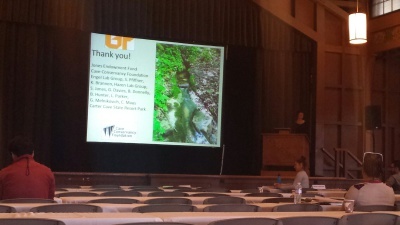 She received best student oral presentation award (tied with another woman) at the International Society on Environmental Biogeochemistry in Piran, Slovenia, for "Evidence for functional niches and dominant carbon utilization pathways in an epigenic cave system prone to nutrient pulses! Welcome Paxton and Hannah to the lab group! 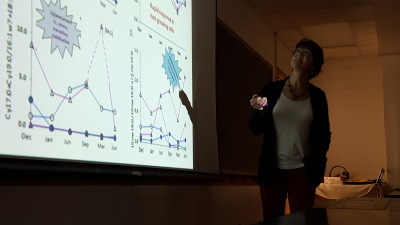 August 2015 - Congrats, Sarah, for getting another dissertation paper published, " Evaluating the consequences of diagenesis and fossilization on bioapatite lattice structure and composition ," in Chemical Geology! July 2015 - Welcome, Brandon, to the lab group! Also, welcome Abby to the group, from earlier this year! Feb & March 2015 - Job postings for postdoctoral research associate and undergraduate student workers! Feb 2015 - Congratulations, Dalia Harmon (former undergraduate in the group) for landing a job with Brown & Caldwell in Nashville! C. Fortier presenting her poster at the Geological Society of America meeting, Seattle, WA, October 2017. T. Brown during her successful defense, Oct. 2016. H. Johnson presenting poster at Geological Society of America meeting, Denver, CO, Sept 2016. 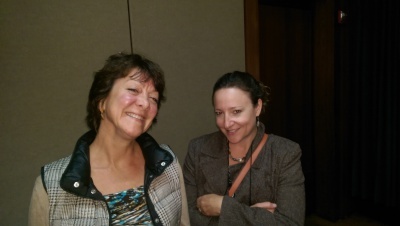 K. Brannen-Donnelly after successful defense, Oct. 2015. Walt Doty after successful defense, Oct. 2015. 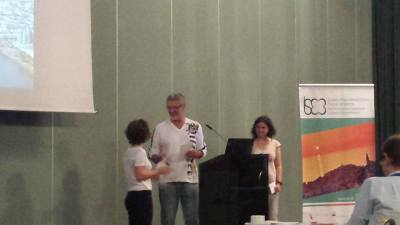 Kathleen accepting her award at ISEB22 in Piran, Slovenia. 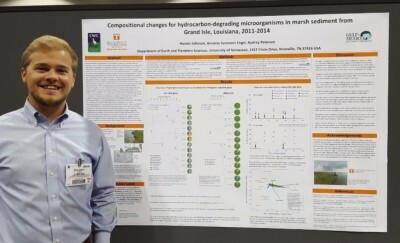 Walt showing off his poster at the SBS 2015.